& Serak Cheribon directly from Pak Serak. Serak is an internal/external style of Martial Arts with roots from Kuntao (Xing Yi, Tai Chi, Pakua, & Shaolin), Kilap, Cimande, Cikalong, Harimau, Monyet, Palembang Silat, Pekalongan Silat & Kendang Silat. It is a style known for its very fast and explosive hitting and unforgiving takedowns. A Serak player prioritizes the taking of the attackers consciousness and balance through the attack of vital areas, snapping of tendons and potential breaks of bones. It was a system founded by Pak Serak in the 1800's. Pak Serak was a Chinese, Arab, Indonesian Horse trader from Cheribon in the Island of Java. The de Thouars & de Vries family added elements of Dutch Bare knuckle boxing and platforms from Spanish & Dutch Fencing to make the art even more devastating and practical for the modern era. Djurus - Short Forms, some are only with the hands some include foot work & Kuda Kuda (Postures of combat). Langkah- Platforms and foot work and strategies of targets, take downs, body alignment & superior position. Kuda Kuda - Combative postures one of them being the famous "Mabu" or Horse stance of Old Hand Kung Fu "Kuntao". Sambutan - Counter for counter drills, Hand drills, Pukulan Drills, Body Sensitivity Drills & Timing Drills. Weaponry & Empty Handed training. CHINESE & INDONESIAN KUNTAO & SILAT AS PRACTICED BY BAPAK WILLEM DE THOUARS (Uncle Bill). Chinese Kun Tao was introduced to Indonesia, when streams of South East Asian tribes migrated all over the Indonesian archipelago 4.000 years ago. Many people of Cambodia, Viet Nam, India, China and Thailand have settled during that time primarily in Sumatra, Celebes (Sulawesi) and Java. Many of them brought not only their culture with them, but also their matters of fighting for self-defenses. Chinese migrants came through Canton, and Hong Kong to settle in Sumatra in the Palembang area and in Java. As streams of them arrived to settle in the archipelago, most of them came from the South of China and were from the Hokkien region. Chinese Kun Tao as a fighting art consists out of Northern and Southern styles. 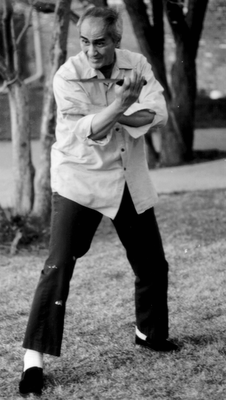 Kun Tao was also considered as one of the oldest terms for Chinese fist arts, comprised in secrets as family styles. Merchants in particular have studied old shaolin boxing arts as a safe guarding system to protect their businesses against attacks from the native Indonesians. In the mid 1800's Chinese Kun Tao became noticed for its formidable fighting arts of self defense. In Palembang by the turn of the century about 7 Kun Tao groups has settled around the city of Palembang. The Chinese were forced to start creating their own secret societies. Some of the Shaolin boxers left China to broaden their future in horizons by immigrating to the archipelago. In the early 1900's they have settled in West Java, Central Java and in Maccasar. The Chinese Kun Tao arts I have studied, as it was instructed to me by very strong Shaolin practitioners were mostly Southern, and some Northern Shaolin boxing arts. The origin and its roots go back to the rooting of Fut ga, the agile and fast movements of Tung Lung T'ai and the White Clouds Baqua. The green Dragon Paqua also influenced the upright positions in the system. Kun Tao as a general term for Chinese fighting arts, as the oldest term used before Wu Su, or kung fu, or gung fu was ever mentioned – was also understood by many Chinese merchants as the term of Kuen Tao, Kuen Dao, and Koon touw. Chuan fa, and Chuan su. Most of the Kun Tao systems practiced in Indonesia are Northern Shan Tung and Southern Hokien. The Northern styles uses long extended techniques with high kicks, many of the legwork are greatly influenced by the Tan Tui system of Shaolin. Sometimes the Northern styles are referred to as the High Mountains of China. The Southern systems on the other hand are noticed for their quick, fast and short range techniques. Both systems are formidable, graceful and powerful fighting arts. Kun Tao techniques may also find their influences in Indonesia's Pencak Silat, and visa versa Pencak Silat may also have influenced Chinese Kun Tao during combat between a Silat exponent and a Kun Tao practitioner. No one knows for sure. As a practitioner of Kun Tao systems, and Indonesian Pencak Silat art, I value the martial practices of each system with much regards. There is always so much to learn about martial arts. I t should be noted that there are 3600 styles of Chinese temple boxing being practiced in the world, as the interest in martial arts is progressing, and there are for certain more than 400 martial arts of Indonesia. I wish anyone on this webpage, and my others as well a blessful New Year for the coming year. It was always great to read the nice written articles on serak or bukti negara. As for my contributions was, and I had given much of my bloodline to the cause of expansion. Except kinda funny thqat Steve Douglas Gartin is leadging on the de Thouars wall claiming his home page as my home page. And quite a silly drunk man for me really seeing it as very silly that i would be stupid to join the American kun tao silat — a name i had given in the beginning to his organization. I rebuke and disacknowledge the whole American kun tao silat for having anything to do with me. They are rebuked and long terminated as unwanted in my book of records. I advised them many times to consider for justifying their cause for having a lineage rather under Theo Tjong Oen or U Un Suraya. Keeping my name as their teacher is totally dishonoring me, and my legacy. While Gartin had never finished in my system with only the most two or three years of training in my system. Who is this cabrone anyway? Caringly bapak Willem de Thouars.